DIRECTV’s new LNBs are really cool in everything they do, but you’ll need some special equipment to aim them. 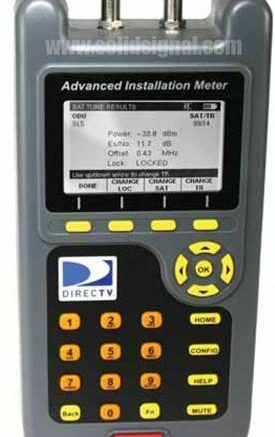 If you really want the professional experience, there’s only one meter to use: DIRECTV’s own Advanced Installation Meter (AIM.) Obviously this is not the cheapest meter on the market and it may seem a little expensive for some hobbyists. Unfortunately none of the other meters, even previous commercial DIRECTV meters, will work with the new DSWM13, 3D2, and Reverse Band LNBs. If you can’t afford an AIM meter, you should consider picking up a legacy Slimline 5 LNB to use just for aiming. Once it’s in place, you can swap in the new LNB and it should be pretty close. If you already have an AIM meter, make sure it’s running the latest database and meter software. Just to be safe, allocate a day to do this when you don’t have installs, because a few people have reported that the update fails and they had to call Trilithic (the number is on the meter) for help recovering it. Can you mount your dish to a tree?